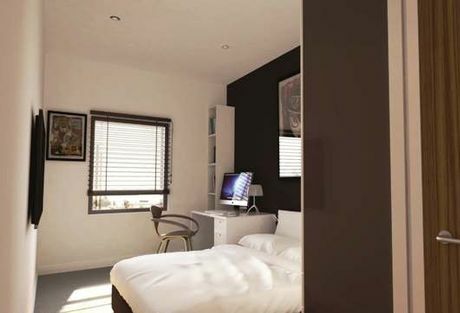 Bateson Building is a luxurious student development located in the heart of Liverpool. The renovation of Bateson Building completed in 2015 and brought 102 contemporary en-suite student pods to Liverpool. Each pod ranges in size from 12 to 15 square metres and features; three quarter beds, en-suite facilities (toilet, sink and shower) and a study area. Each floor also features a spacious and central communal lounge and kitchen facility with large flat screen TV’s and WiFi. Student residence will also benefit from other on-site facilities from; an inner decked court yard on the ground floor and gym to a laundry room, parking and a door entry system and 24-hour surveillance team. The resale unit we have available is an accessible en-suite unit marketed at £54,995 and generating an assured net rental of 7.27% until September 2020. Bateson Building is located within close-proximity of both Liverpool’s world class Universities, the iconic Liverpool One shopping complex and Liverpool city centre, all within a short walk of the location. The finish and location of the Bateson Building continues to attract student residence, making it an extremely popular accommodation in Liverpool. If you would like more information about Unit B10 on Bateson Building in Liverpool, don’t hesitate to contact us on enquiries@hopwoodhouse.com or call +44 (0) 161 337 3890.